Background: Caesalpinia crista is a medicinal herb used to cure various ailments in subtropical and tropical regions of Southeast Asia. Objective: The objective of this evaluation of C. crista against free radical induced DNA and erythrocyte damage. Materials and Methods: The profiles of polyphenol and flavonoid were quantified through reversed-phase high-performance liquid chromatography. Free radical induced DNA and membrane damage were performed using H2O2as oxidative agent. 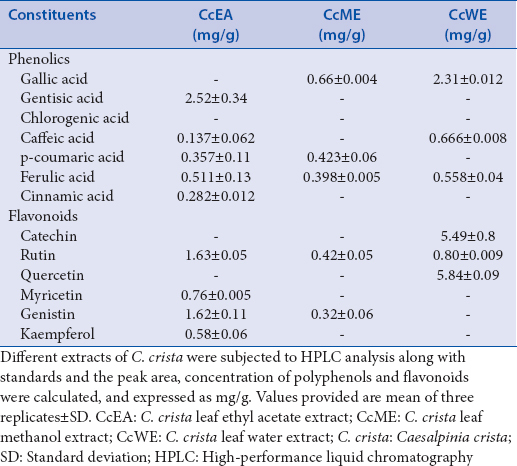 Results: The total polyphenol content of C. crista leaf ethyl acetate extract (CcEA) was 94.5 ± 3.8 mg/gGAE, CcME (C. crista leaf methanol extract) was 52.7 ± 2.8 mg/gGAE, and CcWE (C. crista leaf Water extract) was 31.84 ± 1.8 mg/gGAE. Total flavonoid content of CcEA was 60.46 ± 2.3 mg/gQE, CcME was 46.26 ± 1.8 mg/gQE, and CcWE was 20.47 ± 1.1 mg/gQE. The extracts also exhibited good antioxidant activity as confirmed by 2,2-diphenyl-1-picrylhydrazyl (DPPH), 2,2'-azino-bis (3-ethylbenzthiazoline-6-sulfonic acid), hydroxyl scavenging, reducing power, and total antioxidant assays. Among the three extracts, CcEA and CcME showed better protection against red blood cell (RBC) hemolysis and DNA damage as confirmed by electrophoretic study. Further, Scanning electron micrograph data showed that CcEA revealed the free radical induced structural alterations in RBC. Conclusion: These findings suggest that C. crista contains bioactive molecules and can inhibit oxidative stress and can be source of further study to use this in herbal medicine. Abbreviations used: ABTS: 2,2'-azino-bis (3-ethylbenzthiazoline-6-sulfonic acid); CcEA: C. crista leaf ethyl acetate extract; CcME: C. crista leaf methanol extract; CcWE: C. crista leaf Water extract; DPPH: 2,2-diphenyl-1-picrylhydrazyl; GAE: Gallic acid Equivalent; H2O2: Hydrogen Peroxide; QE: Quercetin Equivalent; RNS: Reactive Nitrogen Spevcies; ROS: Reactive Oxygen Species; SEM: Scanning Electron Microscope. ROS are generated under normal biological systems. These ROS generated can be scavenged by endogenous and exogenous cellular mechanisms. Environmental stress, radiation, smoke etc. elevates ROS dramatically. This leads to significant damage to cellular biomolecules like DNA and cell structures. Plants as a large reservoir of drugs for protecting DNA and cell structures from oxidative stress. Polyphenols present in the C. crista extracts acts through several mechanisms to quench free radicals. Extracts exhibited potent antioxidant properties and also protected DNA and cell membrane from oxidative damage. Hence this can be used in herbal medicine for treating oxidative stress mediated diseases. The oxidative stress is the part of normal cellular activities in the metabolic system. When the oxidative stress is not managed properly, it may result in several disease conditions, namely, neurodegenerative disorders, metabolic disorders, and cardiovascular diseases. The imbalance between antioxidants and free radicals leads to oxidative stress. Free radicals can be derived from exogenous sources such as radiations, environmental contaminants, stress, and cigarette smoke which cause disturbance in homeostasis between free radicals and antioxidants in our body. Therefore, excessive production of reactive oxygen species (ROS) can damage cellular biomolecules such as nucleic acids, proteins, lipids, and resulting in pathological conditions such as cancer, neurodegenerative diseases, and other stress-related diseases.,, DNA and erythrocytes have been extensively used as simple model to study the effect of bioactive molecules on induced DNA and erythrocyte membrane damage., DNA damage is mainly caused by ROS/RNS. ROS/RNS-induced DNA damage results in single- and double-stranded DNA breaks and formation of DNA adduct. DNA damage accumulates in body cells and which further leads to loss of gene expression and loss of functions. The present study is planned to use natural product, plant as a source of novel drug candidate for protecting DNA and erythrocyte from oxidative damage. Natural bioactives acts through several mechanisms to quench free radicals, reducing peroxides, chelating transition metals, and also antioxidative defense enzyme system. The plant derived botanicals, extracts, and their bioactive constituents have spectrum of biological activities. The interest in secondary metabolites such as polyphenols, flavonoids, alkaloids, and terpenoids have considerably increased in recent times because of their potential role in preventing oxidative stress-induced diseases. Different medicinal plants have been used in the preparation of drugs for treating various ailments. Many research findings have shown that plants can play effective role against DNA damage. Nowadays, there is an intensive research on identifying novel antioxidants from naturally available sources. These antioxidants counteract free radical ions and inhibit oxidative damage caused by free radicals. Further, it is essential to identify and isolate bioactive compounds which are responsible for therapeutic use. Caesalpinia crista Linn. belongs to the family Caesalpiniaceae. It is widely distributed throughout India, subtropical and tropical regions of Southeast Asia. Traditionally, extracts of C. crista are used as stress relaxation health drink by forest dwellers and also used as health tonic for rheumatism and backache., The most of the parts of C. crista such as stem, root, leaf, and seed contains cassane and norcassane such as diterpenoids. The extracts of C. crista have varied bioactivities, namely, anti-inflammatory, antihelmintic activity, memory enhancer, free radical scavenging activity, anticancer, and hepatoprotective. The previous experimental study provides the evidence that C. crista could able to inhibit the amyloid β(42) aggregation from monomers and oligomers and also able to disaggregate the preformed fibrils. Furthermore, aqueous extract of C. crista could act as anti-inflammatory agent by inhibiting 5-lipoxygenase in vitro. Earlier findings suggest that botanical preparations are nontoxic or very low toxicity toward human cells. In the current study aimed at elucidating the profiles of polyphenols and flavonoids and determining their role in combating oxidative stress-induced DNA and erythrocyte membrane damage. Agarose, 4-(2-hydroxyethyl)-1-piperazineethanesulfonic acid, Folin–Ciocalteu reagent, and trichloroacetic acid were purchased from Sisco Research Laboratories. δ-DNA was purchased from Bengaluru Genei, India. FeSO4.7H2O, H2O2, 2,2-diphenyl-1-picrylhydrazyl radical, 2,2'-azino-bis (3-ethylbenzthiazoline-6-sulfonic acid) (ABTS), 2-deoxy-D-ribose, TRIS base, ascorbic acid (AA), Na2 EDTA, ethidium bromide (EtBr), caffeic acid, p-coumaric acid, cinnamic acid, ferulic acid, gallic acid, gentisic acid, protocatechuic acid, syringic acid, vanillic acid, catechin, myricetin, daidzein, quercetin, kaempferol and ethylenediaminetetraacetic acid, thiobarbituric acid (TBA) were purchased from Sigma Chemicals Co., (St. Louis, MO, USA). All other chemicals used in the experiment were of analytical grade. C. crista plant was collected in Pachapur Hobli, Belgaum district, Karnataka, India. Lying between 15° 52' North latitudes and 74° 34' East longitude. Collected plant was identified from the botanist (taxonomic deposit number: 417358). The collected plant was washed with running tap water to remove soil and other dust particles followed by washing with distilled water. The leaf sample was separated and shade dried at room temperature (25°C) for 1 week. The dried leaf was finely powdered using domestic mixer and sieved using 18 mm mesh size sieve. Fifteen grams of finely powdered leaf was extracted with 150 mL of Hexane for 6 h, followed by extraction with 150 mL of ethyl acetate for 12 h using Soxhlet apparatus. The extract is filtered using 0.45 mm filter paper; the extract was then concentrated at 40°C. Further, the extract was freeze dried to achieve complete removal of solvent and stored at 4°C for further use. The residue obtained from ethyl acetate was extracted with 150 mL of methanol for 12 h using Soxhlet apparatus and it is filtered using 0.45 mm filter paper. The extract was then concentrated at 40°C followed by freeze drying for complete removal of solvent and stored at 4°C for further use. The residue obtained from methanol extraction was further extracted with 10 g of dried residue were added into 100 mL of sterile double-distilled water, followed by boiling for 20 min, and the infusion obtained was filtered with sterile filter paper Whatman no 1 under sterile conditions. The extract was then concentrated by freeze drier (DELVAC company, model no 00-12). C. crista leaves were extracted in ethyl acetate (CcEA), methanol (CcME), and water (CcWE) these extracts were used for further studies. The extracts obtained were dissolved in dimethyl sulfoxide and water with known concentration for further studies. The total polyphenols of C. crista extracts were determined by Folin–Ciocalteu method. Extracts of different volumes were mixed with aqueous Na2 CO3 (1.5 mL) and vertexed followed by adding 500 μl of Folin–Ciocalteu reagent and incubated for 5 min at room temperature. The solution was incubated in the dark for 2 h. The absorbance was measured at 734 nm using ultraviolet (UV)/visible light spectrophotometer. The result was expressed in gallic acid equivalent (GAE) using (0–100 μg/mL) standard curve. Detection and quantification of polyphenols in the C. crista extracts were done according to the previously described method with slight modifications using reversed-phase performance liquid chromatography (HPLC) system (Agilent Model 1200 series) with diode array detector (operating at 254 nm and 320 nm). A gradient solvent system was used which consists of solvent A; water: acetic acid (98:2) and solvent B; acetonitrile was used as mobile phase at a flow rate of 1 mL/min for a total run time of 60 min. The gradient elution was done as follows: 100% A to 85% A in 30 min, 85% A to 50% A in 20 min, 50% A to 0% A in 5 min, and 0% A to 100% A in 5 min followed by 4 min post run for column reconditioning. Known concentration of polyphenol standards such as caffeic acid, p-coumaric acid, ferulic acid, gallic acid, gentisic acid, protocatechuic acid, chlorogenic acid was used for identification and quantification of phenolic acids present in the extracts. The total flavonoid content of C. crista extracts was determined by adopting earlier described method. Quercetin (0–100 μg/mL in methanol) was used as a standard reference. The standards and the extract solutions (500 μL) were mixed with 0.1 mL of 10% (W/V) aluminum chloride, 0.1 mL of potassium acetate, 1.5 mL of methanol, and 2.8 mL water. For the blank, both potassium acetate and aluminum chloride were added, and their volume was replaced by water. The reaction mixture was incubated for 30 min at room temperature, and the absorbance was taken at 415 nm. The result was expressed as quercetin equivalent using (0–100 μg/mL) standard curve. Detection and quantification of flavonoids in the C. crista extracts were done following earlier described method with slight modifications. The standards used were catechin, myricetin, daidzein, quercetin, and kaempferol. The column used was reversed-phase C18 column (4.6 mm × 250 mm) HPLC system (Agilent-Model 1200 series), and detector is diode array detector (operating at 260 nm). A gradient solvent system is used which consists of solvent A; water: acetic acid (98:2) and solvent B; methanol: acetic acid (99:1). Gradient elution was linear to 10% B in 5 min, 23% B in 31 min, and 35% B in 43 min, followed by 6 min washing with 100% B, and equilibrated for 6 min at 100%. A with total run time of 55 min. The detection and quantification of flavonoid were done at 260 nm. The effect of C. crista extracts on 2,2-diphenyl-1-picrylhydrazyl (DPPH) radical was determined according to the method described earlier with minor modification. A 100 μM solution of DPPH in methanol was prepared. The plant extracts containing different concentrations in terms of GAE (0–25 μgGAE) were mixed with 1 mL of DPPH solution. The mixture was shaken vigorously and left in the dark at room temperature for 20 min. The absorbance of the resulting solution was measured at 517 nm. The control contained all the reagents except extracts. The capacity to scavenge DPPH radical was calculated using the following equation. Where “Ac” is the absorbance of the control tube and “A” is the absorbance of the tube with “c” concentration of sample. The antioxidant activity was analyzed by ABTS method described earlier. 7 mM concentration of ABTS was diluted in water. ABTS radical cations were generated by mixing 7 mM ABTS and 2.45 mM potassium persulfate. The reaction mixture was incubated at room temperature for 12–16 h in dark. After 12–16 h, the reaction mixture was diluted in methanol to obtain an absorbance of 0.70 ± 0.020 at 734 nm. In this study, (0–25 μg/mL) of different concentrations of C. crista extracts was mixed with 1000 μl of ABTS solution, and the absorbance was measured using a UV/visible spectrophotometer (Shimadzu) exactly after 5 min of initial mixing. AA was used as positive control. A dose-dependent curve was plotted to calculate the IC50 value. The reductive potential of the C. crista extracts was determined using standard method. Different concentrations of C. crista extracts (0–200 μg) in 0.5 mL of water was mixed with equal volumes of 0.2 M phosphate buffer, pH 6.6, and 1% potassium ferricyanide (K3 Fe (CN)6). The mixture was incubated for 20 min at 50°C. At the end of incubation, an equal volume of 10% trichloroacetic acid was added to the mixture and centrifuged at 3200 ×g for 10 min. The supernatant was mixed with distilled water and 0.1% ferric chloride at 1:1:0.2 (v/v/v), and the absorbance were measured at 700 nm. An increase in the absorbance of the reaction mixture indicates the potential reducing power of the sample. AA was used as a standard for comparison. A1 is the absorbance in the presence of the sample and deoxyribose and A2 is the absorbance of the sample without deoxyribose. The total antioxidant capacity of extracts was evaluated by the phosphomolybdenum method. The assay is based on the reduction of Mo (VI) to Mo (V) by the extract and subsequent formation of green phosphate/Mo (V) complex at acid pH. In this assay, 0.1 mL of extract was combined with 3 mL of reagent solution (0.6 M sulfuric acid, 28 mM sodium phosphate, and 4 mM ammonium molybdate). The tubes containing reaction mixture were incubated at 95°C for 90 min. The absorbance of the reaction mixture was measured at 695 nm using a spectrophotometer against blank after cooling to room temperature. Methanol in the place of extract was used as the blank. The antioxidant activity was expressed as the number of gram equivalent of AA. The calibration curve was prepared by mixing AA (10–100 μg/mL) with methanol. Rat erythrocytes were isolated and stored as per previously described method. Briefly, blood samples collected were centrifuged (1500 ×g, 5 min) at 4°C, erythrocytes were separated from the plasma and buffy coat and were washed 3 times using 10 volumes of 20 mM phosphate-buffered saline (pH 7.4 PBS). Each time the cell suspension centrifuged at 1500 ×g for 5 min. The supernatant and buffy coats of white cells were carefully removed with each wash. Erythrocytes thus obtained were stored at 4°C and used within 6 h for further studies. Rat erythrocytes (50 μL) were incubated with and without 50 μg C. crista extracts and treated with 100 μL of 200 μM H2O2 for 30 min at 37°C. After incubation, the incubate was centrifuged at 1500 ×g for 10 min, and the cell pellets were processed and were fixed in 3% glutaraldehyde on a coverslip., After fixing on the cover slip, the cells were dehydrated in an ascending series of acetone (30%–100%). The dried samples were mounted on a aluminum stub (100–200 A°) using double-sided tape and coated with gold film with a thickness of 10–20 nm using sputter coater (Polaron, E 5000, SEM coating system). The cells were examined under a scanning electron microscope (SEM) (Model No, LEO 425 VP, Electron microscopy LTD, Cambridge, UK). The inhibition of rat erythrocyte hemolysis by the C. crista extracts was determined as per previously described method with slight modifications. The rat erythrocyte hemolysis was performed with hydrogen peroxide as free radical initiator. To 200 μL of 10% (v/v) suspension of erythrocytes in PBS, C. crista extracts with different concentrations (0–200 μg) were added. To this, 100 μL of 500 μM H2O2 (in PBS pH 7.4) was added. The reaction mixture was incubated at 37°C for 30 min and was centrifuged at 2000 ×g for 10 min. The absorbance of the resulting supernatant was measured at 410 nm by taking 200 μL of reaction mixture with 800 μL PBS to determine the hemolysis. Likewise, the erythrocytes were treated with hydrogen peroxide and without inhibitors (extracts) to obtain a complete hemolysis. The absorbance of the supernatant was measured at the same condition. Percentage of hemolysis was calculated by taking hemolysis caused by 200 μM H2O2 as 100%. The IC50 values were calculated, and the concentration required for the inhibition of 50% hemolysis. 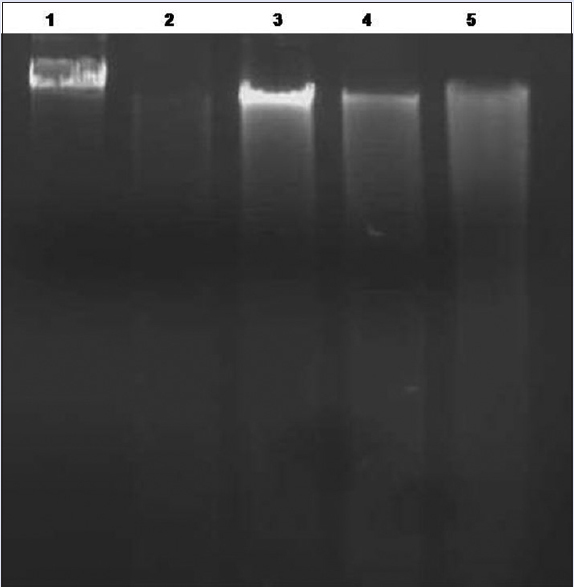 Oxidative δ-DNA damage was prevented by C. crista leaf extract and it was assayed. δ-DNA (0.5 μg) with and without extracts (50 μg) was incubated with Fenton reagent (1 mMFeSO4, 25 mM H2O2 in tris buffer 10 mM, pH 7.4) in a final reaction volume of 30 μL for 1 h at 37°C. Relative difference between oxidized and native DNA were analyzed on 1% agarose gel prepared in tris-acetate-EDTA buffer (pH 8.5) at 50 V for 3 h at room temperature. The gel was documented (Uvitec Company, software platinum 1D, UK), and the band intensity was determined. Protective effect of C. crista extracts against oxidative δ-DNA damage was analyzed by adopting previously described method. The change in fluorescence of EtBr bound to DNA was measured. The assay was carried out by incubating δ-DNA (1 μg) with 1 mM FeSO4, 25 mM H2O2 in 10 mM Tris-HCl (pH 7.4) for 1 h. The protection of oxidative δ-DNA damage was analyzed in the presence of 50 μg of C. crista extracts for 1 h. The samples thus prepared were mixed with 5 μg of EtBr, and the fluorescence was recorded at excitation at 535 nm and emission at 600 nm. The effect of C. crista extracts on the δ-DNA integrity was measured by thermal denaturation studies using Spectrophotometer (Ultrospec, 4300 probe) equipped with thermo-programmer and data processor (Amersham Pharmacia Biotech, Hong Kong). δ-DNA (1 μg) was incubated with 1 mM FeSO4, 25 mM H2O2 in 10 mM Tris-HCl (pH 7.4) for 1 h for monitoring the oxidative δ-DNA damage in the presence of extract (50 μg) for 1 h. The melting profiles (melting temperature [Tm]) of δ-DNA were recorded at different temperatures ranging from 25°C to 95°C. The Tm value was determined graphically from the absorbance versus temperature plots. Three independent experiments were conducted in triplicate, and the data were reported as mean ± standard deviation. Determined using the statistical program SPSS (Armonk, NY: IBM Corp) for Windows, version 10.0, with level of significance of P < 0.05. The amount of total polyphenols present in various extracts was measured by Folin–Ciocalteu method. Quantification was done using standard graph, we found that CcEA 94.5 ± 3.8 mg/gGAE, CcME 52.7 ± 2.8 mg/gGAE, and CcWE 31.84 ± 1.1 mg/gGAE [Figure 1]. The major phenolic acids present in the extracts were identified and quantified using reversed-phase HPLC (RP-HPLC) with standards. The different phenolics in C. crista in the following decreasing order: CcEA; gentisic acid > ferulic acid > p coumaric acid whereas in CcME; gallic acid > p coumaric acid > ferulic acid, and CcWE; gallic acid > caffeic acid > ferulic acid, respectively [Table 1]. Total flavonoid content in the extracts expressed as quercetin equivalent [Figure 1]. The results showed that CcEA in terms of quercetin equivalent content was 60.46 ± 2.3 mg/g, CcME was 46.26 ± 1.8 mg/g, and CcWE was 20.47 ± 1.1 mg/g. Among the three extracts analyzed, CcEA, CcME has high flavonoid content when compared to CcWE. The different flavonoids in C. crista in the following decreasing order CcEA; rutin > genistin > myricetin in CcME; rutin > genistin whereas, in CcWE; quercetin > catechin > rutin were major flavonoids present in the extracts, respectively [Table 1]. The leaf extracts were able to reduce the stable DPPH radical into yellow-colored product. Extracts showed dose-dependent scavenging activity of DPPH radicals. The IC50 values CcEA was 23.9 ± 1.8 μgGAE, CcME was 30.3 ± 2.2 μgGAE, and CcWE was 55.9 ± 3.1 μgGAE and standard AA was 8.36 ± 0.9 μg., The activity of the extracts was compared with the standard AA [Figure 2]a. The antioxidant activity of the phenolic compounds was analyzed by ABTS radical method. The radical ABTS by reacting with oxidizing agent potassium persulphate it becomes dark blue color. The antioxidants present in the extracts as strong hydrogen donor, in which the decrease in the absorbance of the final solution was measured at 734 nm. The antioxidant activity of extracts in terms of IC50 Values CcEA 38.9 ± 1.8 μg, CcME was 54.4 ± 2.1 μg, and CcWE was 98.4 ± 3.8 μg and in standard AA was 16.1 ± 0.8 μg. Average IC50 values determined by ABTS assay were almost lower as compared to the values determined by DPPH assay [Figure 2]b. A hydroxyl radical is one of the major found reactive species in biological systems. The antioxidant effects of C. crista extracts was examined by their ability to counteract free radicals formed. Hydroxyl radical scavenging ability of extracts was analyzed using 2-deoxy-2-ribose method. The results indicate that IC50 values CcEA was 89.7 ± 3.1 μg; CcME was 76.8 ± 2.4 μg/mL and CcWE was 220 ± 5.8 μg/mL and standard AA was 72.17 ± 2.4 μg/mL [Figure 2]c. This indicates that ability of the extracts to participate with deoxyribose and to scavenge hydroxyl radicals. This decreases chromogen product formation which reveals hydroxyl radical scavenging ability. Reducing capacity of the extracts indicates the potential of antioxidants present. The results of this assay indicate that there is a gradual increase in absorbance at 700 nm in a concentration-dependent manner. The trend of different extracts was in the decreasing order CcEA > CcME > CcWE [Figure 2]d. This result gives an insight that the extracts have the ability to scavenge various free radicals. Phosphomolybdenum method involves the reduction of Mo (VI) to Mo (V), and this principle is used to estimate total antioxidant content spectrophotometrically. The formation of green-colored Mo (V) end product after prolonged incubation, and the reducing capacity of the antioxidants in the extract were measured at 695 nm. 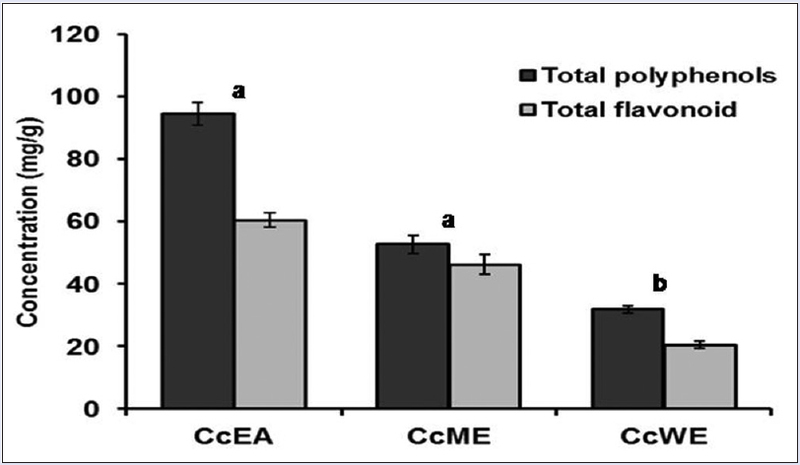 The total antioxidant activity of the extracts found to be decrease in the order of CcEA > CcME > CcWE [Figure 3]. AA was used as a reference standard. The antioxidant activity of extracts is attributed to polyphenols and other antioxidant molecules present in the extracts. 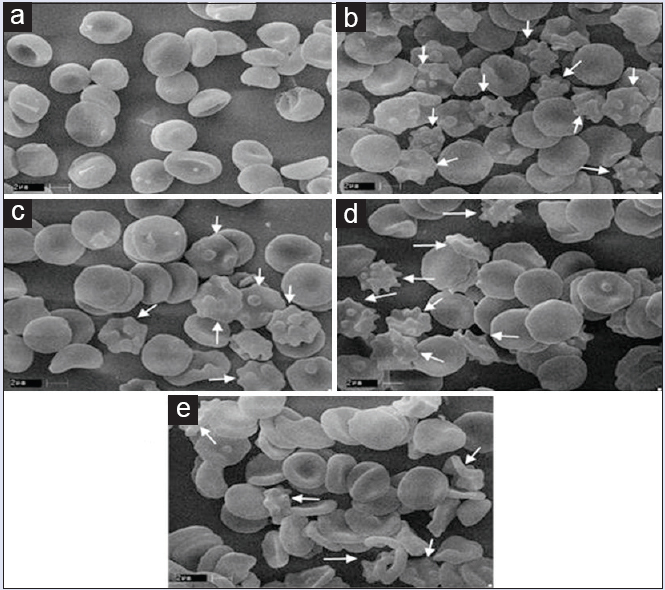 Protective effects of C. crista extracts on oxidative damage were analyzed in the SEM in vitro SEM of erythrocytes incubated with H2O2 alone and extracts [Figure 4]. Control erythrocytes appeared as classic discocytes while exposure to H2O2 resulted in a significant change in the cell shape and distinct echinocyte formation. The changes in the morphology induced by oxidative system were prevented when the cells were treated with extracts. When compounds inserts into the inner layer, stomatocytes are formed. However, speculated-shaped echinocytes are formed when it locates into the outer layer. Thus, result in the present study indicates that extracts prevent the morphological changes induced by oxidants in red blood cell. Oxidants lyse the erythrocyte membrane and leaches out the hemoglobin pigment into the medium. In the current study, membrane damage or hemolysis was induced using H2O2. The protective effect against oxidative damage was studied using C. crista extracts. Oxidants lyse the erythrocytes membrane and lead to release of hemoglobin and found in the medium. The medium turns into red, and it was measured at 410 nm. The different extracts inhibited hemolysis in a dose-dependent manner. All the extracts showed corresponding inhibitory activities against membrane damage. The IC50 values for the corresponding extracts CcEA, CcME, and CcWE, respectively are 88.56 ± 1.88 μg, 112.4 ± 3.88 μg, and 164.28 ± 3.24 μg [Figure 5]. In the current study, the C. crista extracts showed DNA protection caused by the radicals generated by Fenton reaction. [Figure 6] results indicate that δ-DNA in the presence of radicals and with extracts showed increase in the band intensity. Where δ-DNA with radicals and without extracts showed no band in 1% agarose gel. Further, treating δ-DNA with extract alone did not alter DNA integrity which suggests the extract itself is not toxic to δ-DNA. The DNA damage protection activity of C. crista is ascribed to polyphenols and antioxidant molecules that are present in the extract. Free radical causes damage to DNA and base modifications. The measurement of δ-DNA damage by FeSO4/H2O2 is done by noting the changes in fluorescence of EtBr on binding to δ-DNA in the presence and absence of extracts. EtBr fluorescence for intact δ-DNA was 51.51, whereas 27.65 for δ-DNA treated with FeSO4 in the presence of H2O2. The significant decrease in the fluorescence intensity in the case of δ-DNA treated with FeSO4 and H2O2 was due to the damage of DNA by hydroxyl radicals generated. However, the fluorescence intensity for DNA in the presence of FeSO4/H2O2, and C. crista extracts was 47.7, 41.98 and 45.96 for CcEA, CcME, and CcWE, respectively [Figure 7]. The higher fluorescence intensity observed may be attributed to the free radical scavenging activity of polyphenols and antioxidant molecules in extracts. The Tm study provides a structure and dynamics of DNA. The Tm of δ-DNA was 70.5°C, whereas it was 54.8°C, when it was treated with FeSO4/H2O2 [Table 2]. Low Tm in the case of δ-DNA treated with FeSO4/H2O2 was due to the damage of DNA in the presence of hydroxyl radicals. Whereas, Tm value for DNA in the presence of CcEA with FeSO4/H2O2 was 71.6°C, CcME with FeSO4/H2O2 was 68.3°C, and CcWE with FeSO4/H2O2 was 67.3°C. The higher Tm of δ-DNA in the presence of extracts indicates that extracts prevented free radical-induced DNA damage. The mechanism of prevention may be due to the scavenging of free radicals by the polyphenols and antioxidants present in the extracts. The botanicals may be derived from various plant parts such as roots, stem, leaves, bark, and seed. The bioactive molecules have ability to target many pathological conditions. The free radicals are the cause of many disease conditions. The previous studies suggests that free radical scavenging capability of bioactive molecules play an important role in the prevention of chronic diseases such as cardiovascular disorders, metabolic disorders, neurodegenerative diseases., The free radicals causes DNA and membrane damage. Earlier research findings indicate that the electron donating capacity of bioactive molecules coupled with antioxidant activity helps to prevent oxidative stress., Among the free radical species, hydroxyl radical is found in higher concentration in the body. The antioxidants present in the extracts have the ability to quench hydroxyl radicals and prevent lipid peroxide formation. Hence, the bioactives present in the extracts have predominant role in minimizing oxidative stress and its toxicity effect. Earlier findings from the researchers found that hydroalcoholic and methanolic extracts of C. crista have possess rich antioxidant activity., In our current study, the free radical scavenging capability of C. crista extracts was evaluated using various chemical assays, and the results found that CcEA and CcME showed to have greater antioxidant activity. Oxidant damages the cell integrity and leads to disruption in cell rigidity, shape, and leads to the formation of echinocytes. Thus, formed cells eventually affect the functioning of erythrocytes. When oxidant or foreign molecules enter into the erythrocytes leads to changes in the shape and integrity of the membrane due to discrepancy of two monolayers of the red cell membrane., Oxidative stress generates free radicals, causes DNA damage and it implicates for various generative diseases. The presence of antioxidant molecule in the medicinal plants is reported to have protective function against DNA damage. Oxidants produced may lead to changes in the erythrocyte membrane structure as exhibited by decreased cytoskeletal protein content and also changes in the morphology and function. However, ample number of research findings indicates that many medicinal plants can play cytoprotective role.,, Sarkar et al. showed that methanolic extract of C. crista showed protection against Fe(2+)-mediated oxidative DNA damage. 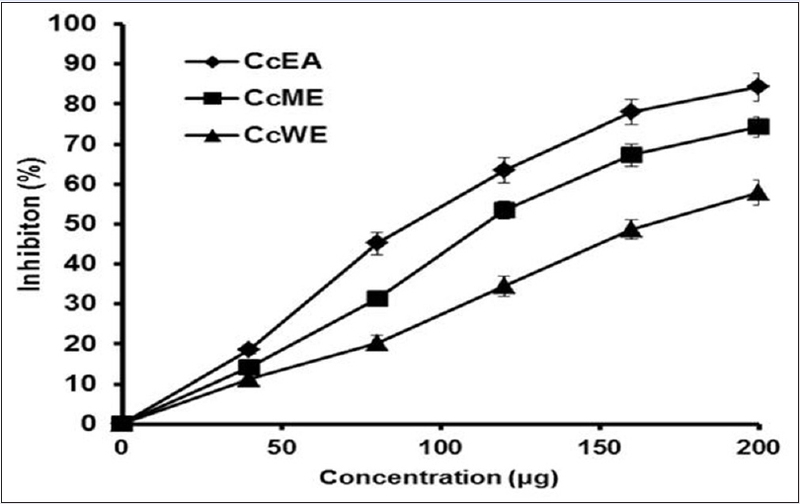 From our results, it is evident that C. crista extracts such as CcEA and CcME were effective in reducing the oxidative stress-induced membrane damage and it was confirmed by SEM [Figure 4]. The drugs from botanicals have increased potency and lesser adverse effects and have become the potential therapeutic interventions for prevention and treatment of many ailments. The findings of this indicate that CcEA and CcME have a significant effect on preventing DNA and membrane damage. The correlation between antioxidant property and protective role of C. crista against free radical-induced DNA and membrane damage suggests the contribution of polyphenols and other antioxidants. Hence, the C. crista extracts may be used as safe antioxidant source and can be further developed into nutraceutical product for many health benefits. The present study shows that C. crista extracts rich in polyphenols. 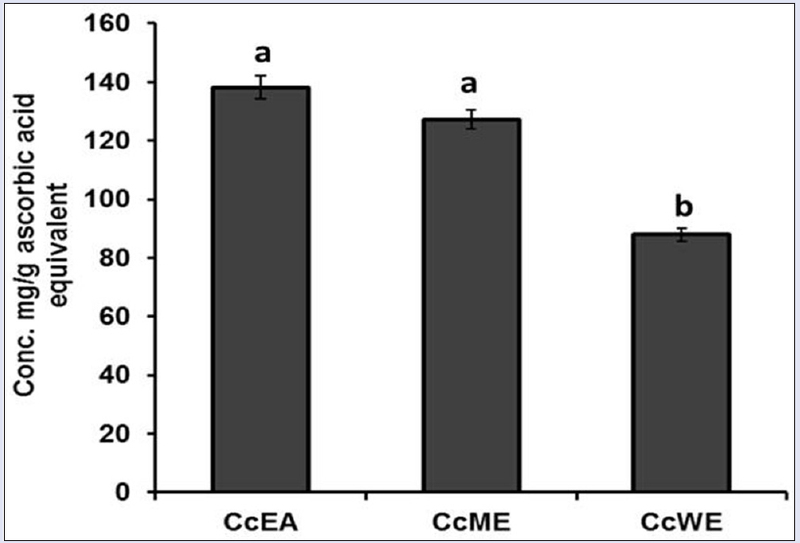 The extracts CcEA and CcME exhibited rich antioxidant properties. It also exhibited protective role against oxidative stress-induced DNA and erythrocyte membrane damage. As the C. crista extracts showed various antioxidant properties in many different systems. It could be used as a source of therapeutic or nutraceutical product to be incorporated in herbal medicine. This work is funded by Startup Grant for Young Scientists to Dr. Ramesh BN by Science and Engineering Research Board, Department of Science and Technology, New Delhi, India. This work is funded by Startup grant for Young scientists to Dr. Ramesh Balenahalli Narasingappa by Science and Engineering Research Board, Department of Science and Technology, New Delhi, India. Bhattacharyya A, Chattopadhyay R, Mitra S, Crowe SE. Oxidative stress: An essential factor in the pathogenesis of gastrointestinal mucosal diseases. Physiol Rev 2014;94:329-54. Chen X, Guo C, Kong J. Oxidative stress in neurodegenerative diseases. Neural Regen Res 2012;7:376-85. Lutsky MA, Zemskov AM, Razuvaeva VV, Lushnikova YP, Karpova OY. Oxidative stress as an indicator of metabolic disorders in the pathogenesis of cerebral stroke. Zh Nevrol Psikhiatr Im S S Korsakova 2016;116:24-9. Nazeerullah K, Sunil K, Singh RP, Dhankhar N. A pharmacognostic and pharmacological overview on Caesalpinia bonducella . Res J Pharm Biol Chem Sci 2012;3:480-96. Sen S, Chakraborty R, Sridhar C, Reddy YS, De B. Free radicals, antioxidants, diseases and phytomedicines: Current status and future prospect. Int J Pharm Sci Rev Res 2010;3:91-100. Rice-Evans C, Burdon R. Free radical-lipid interactions and their pathological consequences. Prog Lipid Res 1993;32:71-110. Barnham KJ, Masters CL, Bush AI. Neurodegenerative diseases and oxidative stress. Nat Rev Drug Discov 2004;3:205-14. Pardo-Andreu GL, Philip SJ, Riaño A, Sánchez C, Viada C, Núñez-Sellés AJ, et al. Mangifera indica L. (Vimang) protection against serum oxidative stress in elderly humans. Arch Med Res 2006;37:158-64. Girish TK, Vasudevaraju P, Prasada Rao UJ. Protection of DNA and erythrocytes from free radical induced oxidative damage by black gram (Vigna mungo L.) husk extract. Food Chem Toxicol 2012;50:1690-6. Nayaka MA, Sathisha UV, Manohar MP, Chandrashekar KB, Dharmesh SM. Cytoprotective and antioxidant activity studies of jaggery sugar. Food Chem 2009;115:113-8. Wiseman H, Halliwell B. Damage to DNA by reactive oxygen and nitrogen species: Role in inflammatory disease and progression to cancer. Biochem J 1996;313(Pt 1):17-29. Zhou K, Laux JJ, Yu L. Comparison of Swiss red wheat grain and fractions for their antioxidant properties. J Agric Food Chem 2004;52:1118-23. Vacca RA, Valenti D, Caccamese S, Daglia M, Braidy N, Nabavi SM. Plant polyphenols as natural drugs for the management of Down syndrome and related disorders. Neurosci Biobehav Rev 2016;71:865-77. Nisha K, Deshwal RK. Antioxidants and their protective action against DNA damage. Int J Pharm Pharm Sci 2011;3:28-32. Fan P, Lou H. Effects of polyphenols from grape seeds on oxidative damage to cellular DNA. Mol Cell Biochem 2004;267:67-74. Das B, Srinivas Y, Sudhakar C, Mahender I, Laxminarayana K, Reddy PR, et al. New diterpenoids from Caesalpinia species and their cytotoxic activity. Bioorg Med Chem Lett 2010;20:2847-50. Eisai PT. Medicinal Herb Index in Indonesia. 1st ed. Indonesia: P.T. Eisai Indonesia; 1986. p. 140. Cheenpracha S, Srisuwan RC, Karalai CP, Chantrapromma S, Chantrapromma K. New diterpenoids from stems and root of Caesalpinia crista . Tetrahedron 2005;61:8656-62. Kalauni SK, Awale S, Tezuka Y, Banskota AH, Linn TZ, Kadota S. Methyl migrated cassane-type furanoditerpenes of Caesalpinia crista from Myanmar. Chem Pharm Bull (Tokyo) 2005;53:1300-4. Ramesh BN, Girish TK, Raghavendra RH, Naidu KA, Rao UJ, Rao KS. Comparative study on anti-oxidant and anti-inflammatory activities of Caesalpinia crista and Centella asiatica leaf extracts. J Pharm Bioallied Sci 2014;6:86-91. 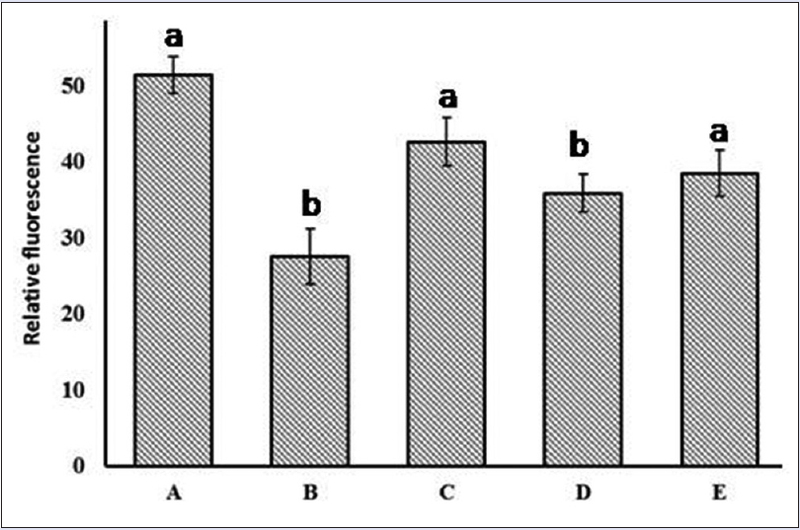 Jabbar A, Zaman MA, Iqbal Z, Yaseen M, Shamim A. Anthelmintic activity of Chenopodium album (L) and Caesalpinia crista (L) against trichostrongylid nematodes of sheep. J Ethnopharmacol 2007;114:86-91. Kshirsagar SN. Nootropic activity of dried seed kernels of Caesalpinia crista Linn against scopolamine induced amnesia in mice. Int J PharmTech Res 2011;3:104-9. Mandal S, Hazra B, Sarkar R, Biswas S, Mandal N. Assessment of the antioxidant and reactive oxygen species scavenging activity of methanolic extract of Caesalpinia crista Leaf. Evid Based Complement Alternat Med 2011;2011:173768. Bodakhe SH, Agrawal A, Agrawal A, Shinde N, Namdeo KP. Anticancer study on alcoholic extract of Caesalpinia crista root bark extract. J Pharm Res Opin 2011;1:126-8. Sarkar R, Hazra B, Mandal N. Hepatoprotective potential of Caesalpinia crista against iron-overload-induced liver toxicity in mice. Evid Based Complement Alternat Med 2012;2012:896341. Ramesh BN, Indi SS, Rao KS. Anti-amyloidogenic property of leaf aqueous extract of Caesalpinia crista . Neurosci Lett 2010;475:110-4. Sengupta T, Vinayagam J, Singh R, Jaisankar P, Mohanakumar KP. Plant-derived natural products for Parkinson's disease therapy. Adv Neurobiol 2016;12:415-96. Singleton VL, Ortofehr R, Raventos LR. Analysis of total phenols and other oxidation substrate and antioxidants by means of Folin-Ciolcalteau reagent. Methods Enzymol 1999;299:152-78. Le K, Chiu F, Ng K. Identification and quantification of antioxidants in Fructus lycii. Food Chem 2007;105:353-63. Muslim NS, Nassar ZD, Aisha AF, Shafaei A, Idris N, Majid AM, et al. Antiangiogenesis and antioxidant activity of ethanol extracts of Pithecellobium jiringa . BMC Complement Altern Med 2012;12:210. Sreerama YN, Sashikala VB, Pratape VM. Variability in the distribution of phenolic compounds in milled fractions of chickpea and horse gram: Evaluation of their antioxidant properties. J Agric Food Chem 2010;58:8322-30. Blois MS. Antioxidant determination by the use of a stable free radical. Nature 1958;181:1199-200. Li P, Huo L, Su W, Lu R, Deng C, Liu L, et al . Free radical-scavenging capacity, antioxidant activity and phenolic content of Pouzolzia zeylanica . J Serb Chem Soc 2011;76:709-17. Oyaizu M. Studies on products of browning reaction-antioxidative activities of products of browning reaction prepared from glucosamine. Jpn J Nutr 1986;44:307-15. Yang HL, Chen SC, Chang NW, Chang JM, Lee ML, Tsai PC, et al. Protection from oxidative damage using Bidens pilosa extracts in normal human erythrocytes. Food Chem Toxicol 2006;44:1513-21. Agrawal D, Sultana P. Biochemical and structural alterations in rat erythrocytes due to hexachlorocyclohexane exposure. Food Chem Toxicol 1993;31:443-8. Hoyer LC, Bucana C. Principles of immuno-electron microscopy. In: Marchalories JJ, Warr GW, editors. Antibodies as a Tool. London: John Wiley; 1982. p. 257-8. Tedesco I, Russo M, Russo P, Iacomino G, Russo GL, Carraturo A, et al. Antioxidant effect of red wine polyphenols on red blood cells. J Nutr Biochem 2000;11:114-9. Ghanta S, Banerjee A, Poddar A, Chattopadhyay S. Oxidative DNA damage preventive activity and antioxidant potential of Stevia rebaudiana (Bertoni) Bertoni, a natural sweetener. J Agric Food Chem 2007;55:10962-7. More SV, Kumar H, Kang SM, Song SY, Lee K, Choi DK. Advances in neuroprotective ingredients of medicinal herbs by using cellular and animal models of Parkinson's disease. Evid Based Complement Alternat Med 2013;2013:957875. Siddhuraju P, Mohan PS, Becker K. Studies on the antioxidant activity of Indian Laburnum (Cassia fistula L.): A preliminary assessment of crude extracts from stem bark, leaves, flowers and fruit pulp. Food Chem 2002;79:61-7. Yen GC, Duh PD, Tsai CL. Relationship between antioxidant activity and maturity of peanut hulls. J Agric Food Chem 1993;41:67-70. Rajkumar V, Guha G, Ashok Kumar R, Mathew L. Evaluation of antioxidant activities of Bergenia ciliata rhizome. Rec Nat Prod 2010;4:38-48. Linderkamp O, Kiau U, Ruef P. Cellular and membrane deformability of red blood cells in protein infants with and without growth retardation. Clin Hemorheol Microcirc 1997;17:279-83. Sheetz MP, Singer SJ. Biological membranes as bilayer couples. A molecular mechanism of drug-erythrocyte induced interactions. Proc Natl Acad Sci U S A 1974;71:4457-61. Lim HW, Wortis M, Mukhopadhyay R. Stomatocyte-discocyte-echinocyte sequence of the human red blood cell: Evidence for the bilayer- couple hypothesis from membrane mechanics. Proc Natl Acad Sci U S A 2002;99:16766-9. Attaguile G, Russo A, Campisi A, Savoca F, Acquaviva R, Ragusa N, et al. 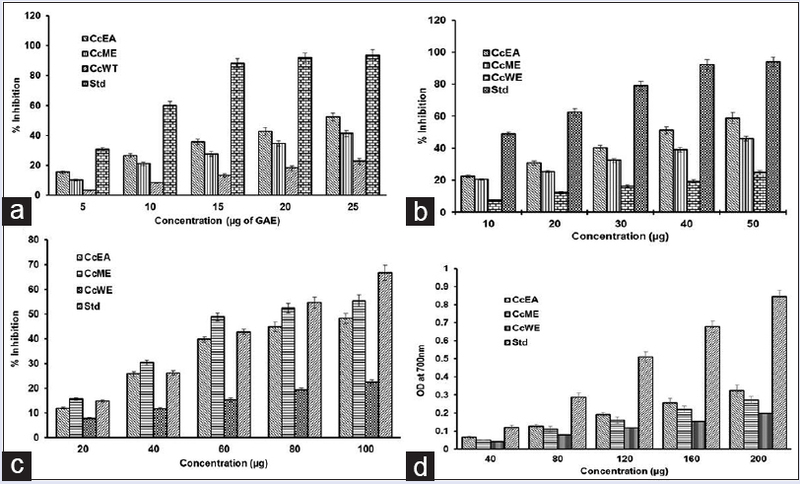 Antioxidant activity and protective effect on DNA cleavage of extracts from Cistus incanus L. and Cistus monspeliensis L. Cell Biol Toxicol 2000;16:83-90. Battistelli M, De Sanctis R, De Bellis R, Cucchiarini L, Dachà M, Gobbi P. Rhodiola rosea as antioxidant in red blood cells: Ultrastructural and hemolytic behaviour. Eur J Histochem 2005;49:243-54. Shinobu-Mesquita CS, Bonfim-Mendonça PS, Moreira AL, Ferreira IC, Donatti L, Fiorini A, et al. Cellular structural changes in Candida albicans caused by the hydroalcoholic extract from Sapindus saponaria L. Molecules 2015;20:9405-18. Fu W, Zhuang W, Zhou S, Wang X. Plant-derived neuroprotective agents in Parkinson's disease. Am J Transl Res 2015;7:1189-202.